Big Bad Ivory, under jockey Jorge Torres, setting the second fastest time for the $100,000-Guaranteed Mystic Lake Northlands Futurity at Canterbury Park. SHAKOPEE, MN�JUNE 14, 2015�Multiple stakes sire IVORY JAMES sired two finalist Sunday to the Mystic Lake Northlands Futurity at Canterbury Park. Trainer Stacy Charette-Hill saddled second fastest qualifier Big Bad Ivory for owner John Hudson. Ridden by Jorge Torres, the IVORY JAMES gelding drew away in the fifth trial by 1� lengths for the second fastest time of :18.112 seconds. The brown gelding entered the trials off a 2� length maiden victory in his first start for a $20,000-tag at Remington Park in April. Bred by Vaughn Cook, in Oklahoma, from the Check Him Out mare A Little Storm, Big Bad Ivory has earned $16,834 in his two starts. Dividendz finished second in the second trial to post the 8th fastest qualifying time of :18.295 seconds. Victor Hanson conditions the IVORY JAMES colt for owners David and Debra Harsche. Bred in Oklahoma by Bobby Cox, Dividendz is out of the Mr Jess Perry mare Jess A Lil Bit More. Ishmael Ricardo had the riding call. For a complete list of the Mystic Lake Northlands Futurity qualifiers, their times, sires, dams, owners, breeders and jockeys CLICK HERE. In related qualifying trial news, Sam Houston Futurity(G3) winner Ivan James qualified to the $100,000-added Firecracker Futurity at Delta Downs Saturday night. The stakes winning IVORY JAMES colt suffered his first loss in three starts when he got beaten a neck by Old South Futurity winner Not Perry Pretty. Owned-and-bred by Jorge Meraz, Ivan James has earned $251,640 this season. Rodolfo Sanchez is the trainer and Raul Ramirez, Jr. had the riding call on the colt out of First Dashin Bye, by Dashin Bye. A Kool Secret, by No Secrets Here, qualified 8th fastest for the Grade 2 Firecracker. Also ridden by Ramirez, Jr., the No Secrets Here colt races for Norma Guerrero and Cynthia Cruz. 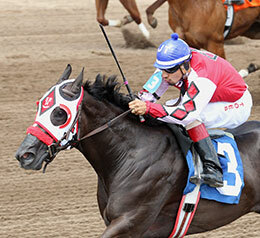 Second in the Harrah's Entertainment Futurity(G3) in March, A Kool Secret is trained by Isidro Flores. The homebred out of A Kool Zoom, has eared $44,125. For the 10 finalists to the Firecracker Futurity along with their connections, times, sires and dams CLICK HERE.